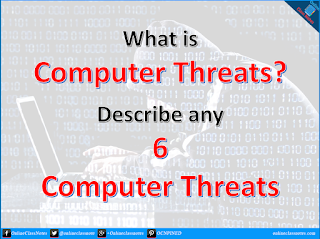 What is computer threat? 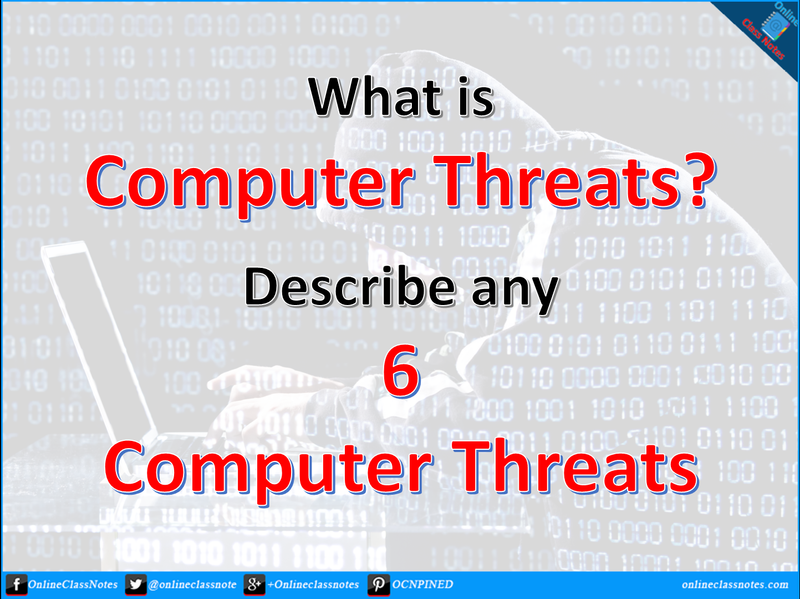 Describe 6 computer threats. A threat, in general, is a person or a thing likely to cause damage or danger. In computer security, a computer threat is a possible danger that might exploit vulnerability to breach security and therefore cause possible harm. A computer threat is any activity that can cause damage to private or any data of an user or organization or any system in ways like removing, stealing, manipulating etc. This can be more summarized to unauthorized access to data of a system and causing damage to that. Following are 6 computer threats out of many available. Botnets are collection software robots, shortly Bots, which are not actually physical robots but computer programs and connects it's host system to a controller program at a remote host. Botnets are largely undetected. These botnets can send spam emails, can spread malware, can use a machine as a part of denial or service attach against another system etc. A DDoS attack is when a malicious user uses botnet infected multiple computers to send request to a server (or website) over and over again that causes the server to become overloaded with pending requests which ultimately causes the server to shutdown, or to stop taking requests but terminating services. It is distributed as the attack is from multiple computers. Denial of Service, As its name implies, a DoS attack is an attempt to make a computer resource such as a website or web service unavailable to it's legitimate users. This is because, every machine has a limit for the number of requests they can receive to number of services they can serve. The flood of incoming requests to the target system essentially forces it to shut down, thereby denying access to it's legitimate users. Activity to gain access to a computer system without authorization is called hacking. People who perform hacking are called hackers. Hacking can be for good and for destruction. Hackers can try to hack a system, such as a software, a network etc. to find out all possible access to the system and then developers or engineers can fix those. However, when hackers go beyond this and access the system to steal information from it and manipulate or destroy the information in it, that is hacking for bad purpose. The activity in which a hacker accesses an web server and modifies the source code of an web page to redirect all requests to the website to another fake or bogus website or intentionally harmful website. An hacker can also this by hacking DNS servers. Targets of Pharming are many such as takings users of a famous website to a bogus website to bring down the reputation of the famous website etc. Phishing is the activity of creating a fraud web page looking exactly the same as another website and collecting user's private information such as username, email, password, credit card information through that fraud web page as the user, in most cases, will think this fraud web page is their desired web page. For example, an user is reading shopping in an ecommerce site and finds the payment button to enter credit card information. Clicking on it brings the payment page of the bank. However at this point, this page could be a fraud page, also the ecommerce site was also a fraud site as that sent the user to this fraud page. This page looks exactly the same as the bank's page and the user will enter his'her credit card information which will actually be collected by the fraud team. A way to stay away from this is to check the URL in which you are entering information instead of looking at the page only. A keylogger is a malicious software generally installed by other malware that can capture and record user's keystoreks. These data then will be sent to a remote program where the data will be analyzed to find out information like username, email, password etc. everything typed by the user. So this can be very dangerous and this doesn't bring any harm to the machine as it doesn't need to which helps it to remain silently, hidden in the system.